I used to travel to exotic places, act spontaneously and take risks. Now, adventure is a hibachi dinner at Benihana. An epic adventure is the chef’s trick shrimp toss into his pocket that drops down my blouse by mistake. So when my husband Chris informed me that I’d have to drive my sixteen-year-old daughter Heather and her friends to summer camp in the Poconos by myself because he’d be on a Las Vegas business trip (an oxymoron if I ever heard one), I worried. “You’ll be fine, you can do this,” he said. “But I’ll have to cross the border!” I cried. I had grown accustomed to a quiet suburban life. I didn’t enjoy leaving home anymore, especially to enter the wilderness where I might face dangerous wildlife like snakes, bears, and suburban campers. But I wanted to expand my comfort zone and show my kids that each time we face our fears, we gain strength, courage and confidence. So I piled the car with sleeping bags, suitcases, and teenage girl camping essentials: curling irons, laptop computers and lip gloss. Then I spent the next two and a half hours driving in the rain and nagging my daughter to turn down the rap music blasting from the radio. We’d barely left New Jersey when I spotted an unusual highway sign. 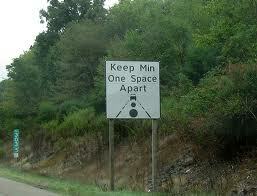 It said, Keep Min One Space Apart. A series of equally spaced elliptical white dots marked the center of the road in front of me. I sped over them, not sure what to make of the painted ovals. It looked like a giant game of Road Twister for bored travelers. I was waiting for the next signs to say, Left Tire, Green and Right Fender, Red. “Did you girls see that unusual highway sign?” I asked. “Girls!” I shouted. Heather grunted and turned down the radio for a while, which allowed me to remove my fingers from my ears and steer without using my knees. It also gave me the chance to listen in on their conversation. We looked across the divide to see a freshly struck deer on the side of the highway. Vultures circled above. It was horrible. All we needed was a pack of hyenas feeding on a young gazelle to complete the “Animal Planet” nightmare. Nobody responded, so I glanced in the rearview mirror and noticed they had all donned headphones. I sighed, and turned on the news. We finally pulled up to camp—in a downpour. By the time I unloaded the car my clothes were completely soaked. My daughter gave me a wet hug and I raced home, eager for this adventure to end. I strained to hear NPR at full volume over the rain as I daydreamed about full-serve gas pumps and one less person to do laundry for. I was trying to ignore the distracting dots when a police siren sounded behind me. I pulled over. Lesson learned: When we face our fears we gain strength, courage, confidence, and in some cases, a moving violation. Love the road twister! Congrats on the birth of your blog. Boy or girl? LOL joanne! at least this birth didn’t take place on my living room rug like the last one!